Something for Everyone in Sussex & St. Martins! The St. Martins and Sussex Neighborhood offers a multitude of activities for visitors in all four seasons: winter, spring, summer, and fall! Whether you enjoy golfing, hiking or fishing, the picturesque valleys in the area beckon you for days of fun! Kings County is home to sixteen covered bridges for the ‘kissing bridge’ enthusiast. The region is a photographer’s delight of captivating scenery throughout the year. In winter, Poley Mountain, near Sussex, offers hours of fun on the snow. Skiing, snowboarding, and tubing are great ways to enjoy winter – one hundred days of fun in the 2000-2001 season! Sussex also offers a curling rink and hockey rink for fun on the ice. In spring, fishermen wade into the Neighborhood’s many brooks and streams in search of salmon and trout. Occasionally they also find bass and other species. The fishing continues from April until October. Canoeing and kayaking are also common activities on the region’s many waterways. Are you a bargain hunter? If so, you won’t want to miss the NB Antique Auto Club Inc & Giant Flea Market in Sussex. Held on the third weekend in August, the event draws visitors from far and near. Shoppers often leave laden with treasures, both old and new. The Princess Louise Show Park also hosts horse shows or cattle penning events on most summer weekends. 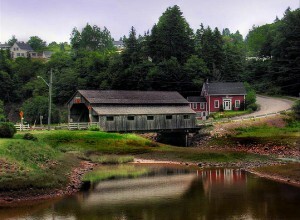 A short drive away, the Fundy Trail Parkway offers a seasonal, multi-use coastal access network. The Parkway offers a low speed roadway with scenic lookouts; a pedestrian/bicycle trail; footpaths to beaches and river estuaries; and an Interpretive Centre at Big Salmon River. 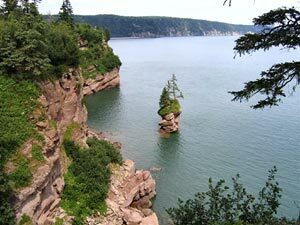 The heartiest hikers may want to hike the Fundy Footpath, spending several days in the wilderness between Big Salmon River and Fundy National Park. Although the Parkway is closed to motorized traffic in winter, cross-country skiers and snow shoe enthusiasts can still enjoy the trails. Nearby St. Martins is home to beautiful sea caves that can be visited – with a bit of wading – at low tide! Watch yourself, though! Those world-record tides can come in quickly, catching erstwhile ‘cave-dwellers’ unaware! The fall foliage in the Sussex and St. Martin’s Neighborhood is spectacular! The area exchanges it’s green summer garb for a stunning coat of many colors each fall. 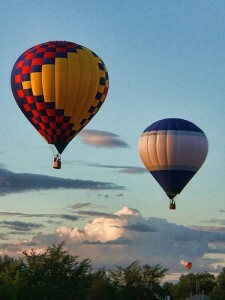 A fall visit also offers the opportunity to take part in the Atlantic Balloon Fiesta, an annual event in Sussex since 1985. The event has welcomed regular balloons and shaped balloons such as The Pink Elephant, The Cow, The Dragon, The Mountie, The Yellow Pages Directory, The Monster Truck, The Maple Leaf, The Canada Flag, The Hawaiian Tropics Fish, Tony the Tiger, and The Purple People Eater!